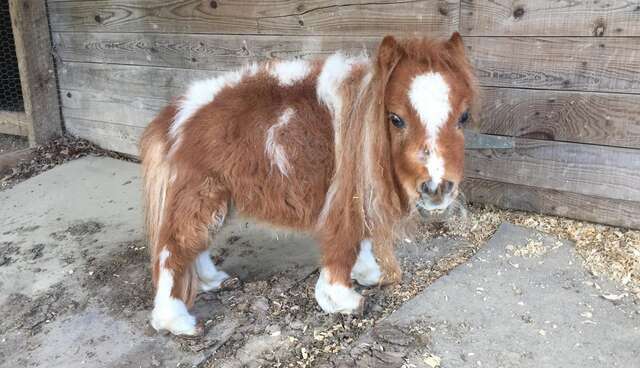 This miniature horse named Tiny is now trotting his little hooves on the long road to better health after being saved from a life of neglect - but he isn't the only one in need of help. 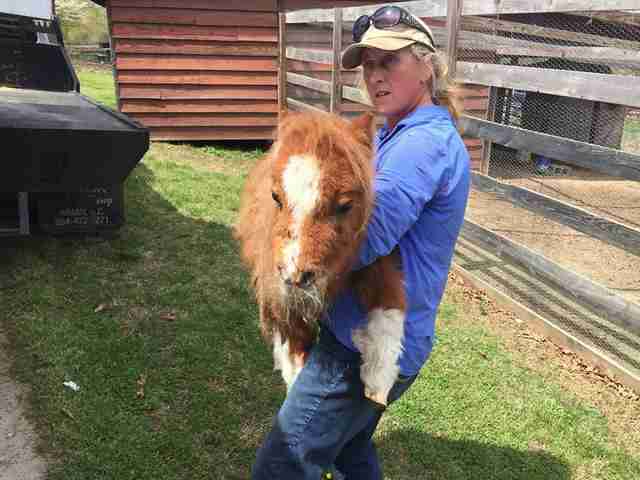 The itty-bitty equine was among 31 mini horses and three donkeys living in unfit conditions and without adequate care on a property in South Carolina. Volunteers from Big Oaks Rescue Farm traveled there with Spartanburg County law enforcement last week on a tip that the animals were suffering from mistreatment. 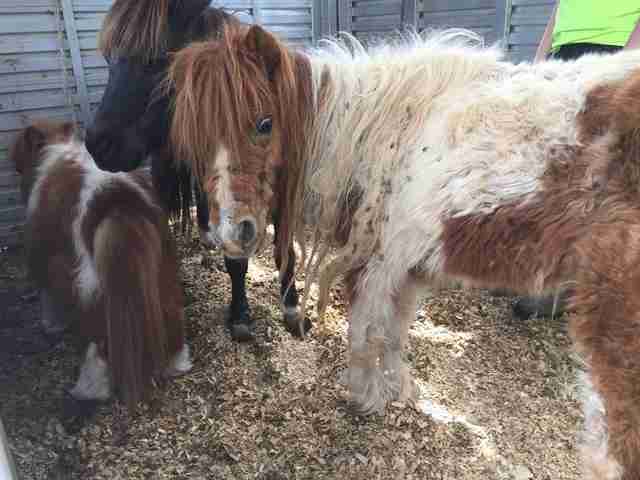 Big Oaks founder Jo Mann told The Dodo the horses were visibly distressed and that their hair and hooves were painfully overgrown. They'd been given rotten hay to eat. 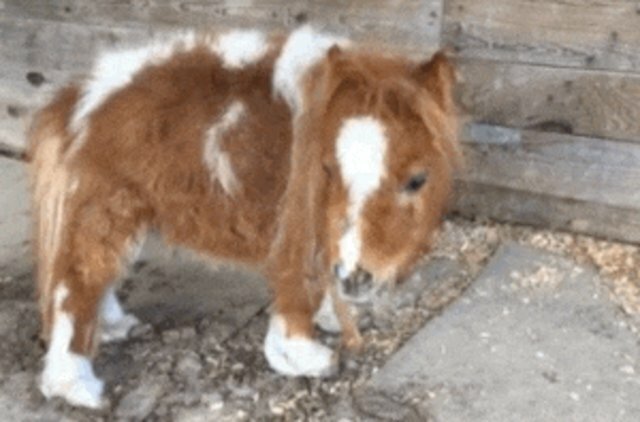 He'd hoped authorities would seize all the animals, but instead officers merely persuaded the elderly owner to voluntarily hand over three - including Tiny - who appeared to be in the worst shape. One of the horses later died. "The remaining two are doing as well as can be expected. They're getting as good of care as they can get," said Mann. "But it's the 31 others still there that I'm more concerned about." Mann is disappointed that the Spartanburg County Office of Environmental Enforcement didn't take more action to rescue the remaining miniature horses, most of whom were locked up inside a "filthy" barn. "The officer in charge that day told me, 'Well, the old man says he love the horses,'" Mann said. "I'd imagine, based on photos shared with me, if you looked inside that barn, it'd make your eyes water. I know counties that would have seized all 34, but not Spartanburg." Instead of being charged with animal cruelty, a felony in South Carolina, the horses' owner and caretaker were issued three citations for ill treatment of animals. James Nelson, head of environmental enforcement, told the Spartanburg Herald-Journal that officers would make repeat visits to check up on the horses, but to Mann, their condition already warrants greater action. "When you see hooves that are overgrown, like elf shoes, starting to turn up and sideways, then you known there hasn't been any proper care. I would venture to say they haven't been trimmed in a couple of years," he said. "The feed outside was black. They're lacking in nutrition." 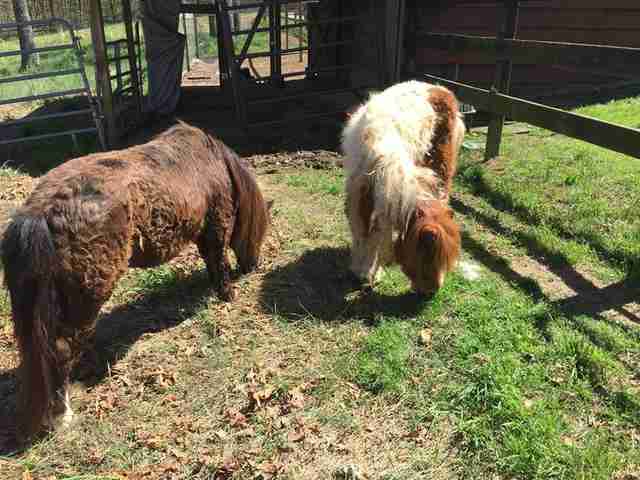 Big Oaks Rescue Farm is equipped to provide safe haven for the remaining miniature horses, but it's up to Spartanburg County animal control to take the first step. "These animals can't call 911, and we don't have any authority to go on the property. We can't do anything, so we have to depend on the authorities," said Mann. "I feel sorry for the old man who owns them, but I can see his horses need help." The Spartanburg County Office of Environmental Enforcement did not immediately respond to The Dodo's request for comment.